We invite you to join the FarmsReach network of Partners & Alliances and our Source Directory. California farmers have asked for easier access to the numerous organizations, suppliers, lenders and service providers in the agriculture industry, and through the FarmsReach platform and Farmers Guild meet-ups, you gain access to an engaged community of farms seeking your products or services. Gain direct access to farmers who are seeking your products, programs or services. Free to join. Basic listings can be enhanced with prominent placement, pictures, videos, educational articles or promotional offerings for $50-1000/month. Connect directly with farmers to gauge their real needs and product or service demand. Maximize your impact by creating an online forum dedicated to just your organization or initiative. As moderator, you can facilitate the conversation, promote events, and create Toolkits for just your group members. Groups can be private or open to all. Present at a Farmers Guild Meet-Up. FarmsReach and the Farmers Guild collaborate with regional partners to co-host regional, monthly meet-ups for farmers across California. At each meet-up it is a lively and social gathering, which includes short presentations from 3 speakers and direct farmer feedback. 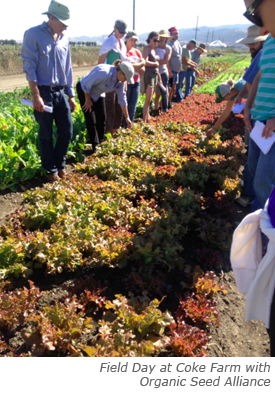 As of January 2014, Farmers Guild meet-ups will be taking place in five California regions – soon to expand. Create custom programs for FarmsReach members. Let’s design something that works for you. We are driven by our members and our partners to find win-win-win programs. Some examples: special group purchasing deals, co-hosted farm field days, promotions of special events, designing workshops; the sky’s the limit. Get in touch with Melanie Cheng: melaniec@farmsreach.com. Demonstrate your commitment to innovation and social/environmental responsibility. Increase your impact in the sustainable agriculture marketplace. Reach farm owners and operators directly. Integrate with the sustainable agriculture movement and community at a grassroots level. Join the Community! FarmsReach helps to amplify your message and expand your reach. And, contact us today to be included in our Source Directory, and learn more about how FarmsReach can help you better reach small and medium-scale farms.